"This makes it possible to respond quickly to fast-changing customer demands and order trends"
Simmons Pet Foods is one of the largest private-label, canned pet food manufacturers in the United States. Besides the private label brands it manufactures for many large retailers, Simmons also produces its own line of national brands such as Twin Pet, Strongheart, Kitty and Fit & Active. The company also owns Simmons Metal Container, which manufactures cans for its own use as well as for outside companies. This unique combination of both food and container manufacturing enables Simmons to offer a flexible variety of foods, sizes and package options to its retail customers. Family-owned Simmons employs 4,100 in the U.S.
Due to its quality reputation, Simmons has faced increasing demand. After extensive planning, it broke ground on an ambitious expansion project in 2005. It is a significant undertaking that has helped to evolve Simmons' manufacturing capabilities to world-class stature. That process continues, and probably won't ever cease as long as the company can wring more productivity out of its operations. A Simmons project engineer said that the company wants to increase capacity by two-thirds or more. In the wake of recent pet food recalls and quality issues, pet owners demanded better, safer, healthier foods, and retailers responded by increasing orders with quality providers like Simmons. According to the company, the market for pet foods had been steadily moving toward what it terms 'premium products', and the recall issues only accelerated that movement. Pet owners were already taking better care of their animals, and this put Simmons in an excellent position to capitalize. Simmons' products were never recalled; in fact it grew during that period because retailers wanted a manufacturer with its high standards. That demand prompted the company to undertake projects to increase the speed and efficiency of its packaging operations. Visitors to the Siloam Springs, Arkansas plant are struck by the remarkable level of cleanliness. Machinery gleams; floors are spotless; dust is nonexistent. This is due to the company's commitment to an operation that is impeccable, flawless, and admirably organized. Simmons needed more throughput and flexibility from its packaging and palletizing operations to meet the escalating demand. The company produces more than 800 recipes in the facility, each into a variety of sizes and packaging options. There are four different can sizes, ranging from 3 to 22 ounces. Throw in variable packaging from standard 24-pack cases to dispenser packs with 4 to 12 cans in each, as well as formed food in loaf, cuts, and slices, and the dizzying possible number of combinations comes into sharp focus. The Simmons team realized that to produce these pet foods in this array of styles and packaging options, its packaging and palletizing operations had to be faster, more flexible, and more efficient. To accomplish this, Simmons retooled its palletizing system. The company has four packaging lines, and can run three at any given time. Any of these lines can feed any of the three palletizers - two high-speed and one medium speed. The palletizers can accommodate any of Simmons' product combinations, allowing the company to produce, for instance, a 12-pack for one customer, a 6-pack for another, or an 8-pack for yet another on the same machines with minimal switchover time. 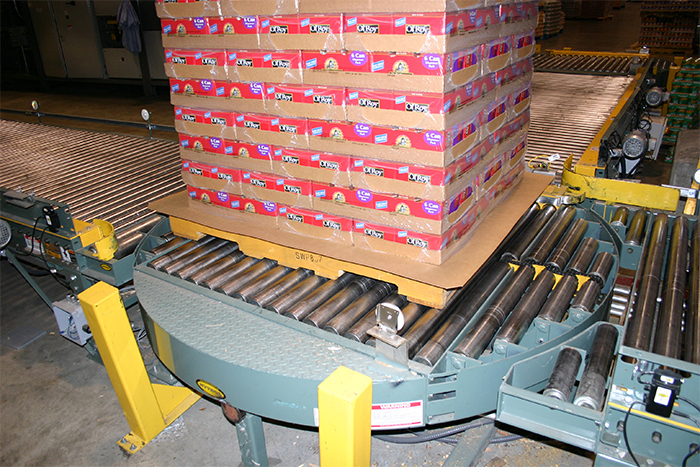 A mixture of minimum and zero pressure accumulation conveyors feeds the palletizers, which helps to maintain no-touch gaps between cases, preventing product damage during the packaging process. The infeed conveyor system is suspended ten feet above the floor as it feeds the palletizers, allowing unobstructed walk and operations space below. 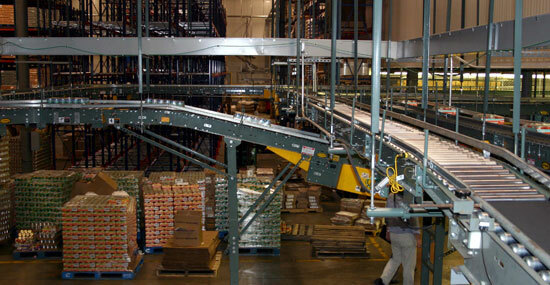 It accepts cases in the correct orientation for the high-speed palletizers at a rate of up to 100 cases per minute. Each production run is dedicated - a single can size, recipe, and finished case size. The system is designed so that the line can be changed in minutes from, for instance, a 6-pack case to a 24-pack case. It could run 3-ounce cans one shift and 5.5-ounce cans the next. This flexibility to service many different pack configurations was critical. After cases reach the palletizers and are completed, they are conveyed on pallet conveyors. Pallets are picked up by lift trucks for their eventual storage or shipping destinations. Rarely is a case lifted by hand anywhere in the process. The system is managed by a combination of individually controlled motors and Hytrol EZLogic control modules. The HMI (human-machine interface) gives Simmons flexibility to make modifications. "They're easier to understand and read than a selection of pushbuttons, switches, and lights," said a Simmons engineer. One challenge that Simmons overcame along the way was the need to implement the new system while maintaining its current operations. Scheduling the installation so that it did not disrupt production was paramount. Timelines and the ability to install new lines parallel to existing ones in use was critical, and the company pulled it off. Simmons got the versatility it needed, and also increased safety, reduced labor costs, and achieved faster throughput. It managed to implement the new system without interfering with its ongoing operations. Simmons had to reduce the number of hand stackers. It wanted to reduce manual labor requirements and prevent injuries. "We don't want guys lifting cases whenever we can help it," said one Simmons official. The process worked; Simmons significantly reduced hand stacking in its packaging and palletizing operation. The system was designed to reduce the labor necessary to ship a case. The ratio of material handlers decreased. Simmons deploys just three handlers per line, per shift. By improving the palletization function, the company became more efficient and increased throughput while decreasing the labor cost per case produced. Due to the high-speed palletizers and mechanized product conveyance, the system has increased throughput. The new palletizers are more than twice as fast as the previous ones, and the conveyor pushes product through rapidly and without damage. The built-in versatility was critical to throughput, since Simmons could quickly and easily change the output. That makes it possible to respond quickly to fast-changing customer demands and order trends. Marketing was also an important facet of the project. Simmons is at the high-end of pet food manufacturers, even when producing value line foods. Its superbly clean, orderly facility is a message in and of itself. Visiting customers say "this is a nice plant. It's got state of the art equipment. It's the real deal. It's well designed." Simmons focuses hard on lean applications and customer needs so it can provide a quality product on a timely basis for the dollar. Simmons is now successful in its new markets and vendors. The material handling system helped it drop product costs and increase customer service.